My first film of Day Two of Sundance was “Untitled Amazing Johnathan Documentary,” which I selected because director Ben Berman was in line behind me at the coffeeshop at Marriott HQ: I saw the title of the film on his badge and it intrigued me, so when it had tickets available I decided to give it a shot. I was glad I did, as I really enjoyed this doc, which is super well-edited and polished in addition to having a fascinating storyline and a lot more depth than most documentaries that tackle an aging, drug-addicted star as a subject. The Amazing Johnathan was a hilarious, hyper magician who became world-famous and rich before having to suddenly retire due to diagnosis of a fatal heart disease; he was given a year to live (clearly, he’s outlived his prognosis). The subject has the familiar trappings of this kind of documentary: Charismatic, charming star, long history of drug use, health issues, relationship stuff – if you’ve spent any amount of time along the film festival circuit you’ve seen your fill of these kinds of docs. 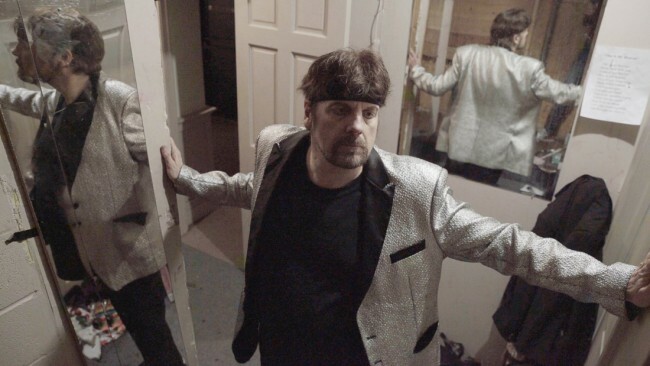 What sets “Untitled Amazing Johnathan Documentary” apart is that about midway through the film there’s a plot twist, followed by another plot twist, followed by a period of tense relationship between documentarian and subject that left Berman sad, morose, feeling badly used, and uncertain as to whether he’d ever finish his film. It’s here that “Untitled Amazing Johnathan Documentary,” not unlike “Winnebago Man,” becomes a film as much about the filmmaker unearthing deep and sometimes unpleasant truths about himself and ultimately becoming part of his own film, as it is about the subject the film thought it was going to be when it grew up. Delightfully entertaining, funny, relatable and nostalgic, while also hitting on key human truths, “Untitled Amazing Johnathan Documentary” is the kind of film that’s ripe for a moderate Sundance sale from a distributor that will get behind it and give it solid support and maybe even an Oscar push. I hustled over to one of my favorite Sundance venues, The Egyptian, to catch “The Magic Life of V” by Tonislav Hristov. You may have seen his terrific film “The Good Postman” here a couple years ago. Like Hristov’s previous work, “The Magic Life of V” is told in a fascinating hybrid documentary style that’s almost fools your brain into thinking it’s a narrative. The luminously gorgeous cinematography in the film is stunning, revealing frame after frame of painterly beauty, often focused on the exquisite expressiveness of its subject, a young Finnish girl named Veera, who can only communicated with others when she’s literally slaying her demons through LARPing (live action role playing, a type of deeply immersive gameplay in which participants assume a character and take it on completely) as “V,” who is something like a character she’s created of her best self as she wishes she could be. The film’s opening frames introduce us to Veera vis-a-vis a conversation Veera has on a bus heading toward a LARP convention about her character, V, who she describes as a girl who is outgoing and friendly and curious. V loves to talk to others and she makes friends easily. V is unafraid to start a conversation. Most of all, V is happy. From all the things V is, we can surmise what Veera is not. The film moves at a languid pace, dipping into the worlds of both Verra and V, so that we can understand both who she is, and what demon she seeks to slay in order to merge Veera and V together into one person who can be happy. In her real life, we meet Veera’s mentally disabled brother and mother through seamlessly and artfully integrated archival footage and the organic conversations Veera has with them. I stuck around for the Q&A in hopes of learning more about the Hristov’s artistic practice, as his body of work is quite extraordinary. The efficacy of his technique, it seems, is in large part due to how he approaches his subjects: he spends a tremendous amount of time getting to know them and understand them personally and intimately, and a minimal amount of time on “scripting” a story; this willingness to stay fluid and follow the subject and story as it unfolds while staying broadly within the structure incepted, allows him to create a sense of safety for his subject that in turn allows his subject the space to take the risk of being so intimate about her personal burdens to a camera. Hristov as a director is what I would characterize as an “auteur” in the purest sense – not in the sense purely of “ego” but in the sense that his films have a very specific trademark style to them that’s original and inspired, and very well suited to this particular subject. The Magic Life of V is a beautiful film in every respect, one of those rare gifts of Sundance that I come here hoping to discover. My third film of the day was “Walden,” directed by Daniel Zimmerman, who previously had a short film in Sundance back in 2011. Meticulously planned and shot, “Walden” takes us along on the journey of trees felled in the woods of a the Catholic Monastery of Admont in Austria, and transported after many steps to the Brazilian rainforest, in a reversal of the usual raw materials trade route upon which wood usually finds itself. Each “piece” of the film represents a sequence of the wood’s journey and is shot with a super-slow 360-degree pan; the film is comprised of 13 such sections roughly 5-6 minutes long, carefully and painstakingly constructed to reveal the absurdity of an economic system in which a disproportionate amount of resources and energy are used to transport raw resources from one part of the planet to another. Presumably the film’s title is an homage to Henry David Thoreau’s “Walden,” in which the writer compresses his two-years-two-months-two-days at the cabin he built on Walden Pond into a single year, using the cycle of four seasons to human personal growth and development. Here, Zimmerman flips Walden’s theme of simplicity through elaborately revealing a series of sequences that are anything but. Zimmerman’s practice as an artist focuses on the meaning and sustainability of human actions, and here he brings that practice to the screen, revealing absurdity of process even as he revels in the beauty of the places in which he’s filming.